“Teams” allow administrators and finance people to access financial transaction information about a set of one or more workflows. Eventually, we'll also add more performance management metrics and aggregated data views at the Team level. When you start using CityGrows, you have a default team (your team name is based on your name to start with). 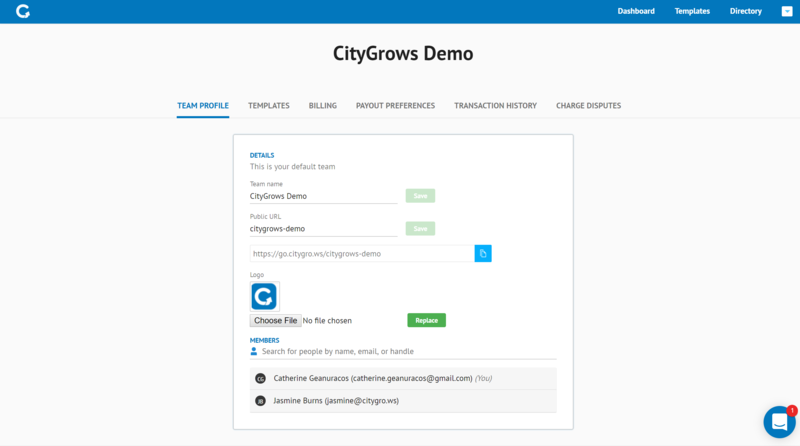 If you're the first one in your organization to start using CityGrows, you might want to rename your default Team something like "(Your Government Name) Testing." You can create additional teams or change your team name or URL any time from your team page. You access your team page from the menu under the arrow at the upper right of the screen. You definitely want to visit the team page and customize your team before you show your sample templates to your colleagues, so that you can add your City's name and logo. Customize the end of your public-facing team URL (same as above, just click on the URL extension and edit it. As long as nobody else has used it, you can save it). While you might think that you should add EVERYONE at your organization to your team, we'd recommend thinking about the team as a place for financial people and managers. Add the staff who will need access to work on your templates to each individual template that's relevant to them. 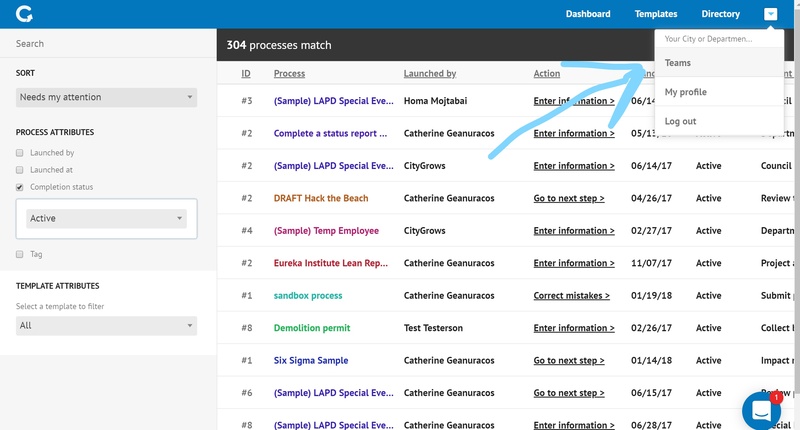 Adding a user to a team is a good way for a management staff member (Department or Division Head, City Manager, or County Administrator) to be able to see across multiple templates within a team, without having to receive multiple email notifications or have a dashboard cluttered with lots of processes. It’s at the Team level that bank account/ payout information is set up and managed (click on Payout Preferences to set up bank account info for the first time), so it's a great place to add representatives from your accounting teams or finance departments who need access to reconcile transactions or see cash flows into your government's bank account.